DepDelay         Difference in minutes between scheduled and actual departure time. Early departures show negative numbers. ArrDelay         Difference in minutes between scheduled and actual arrival time. Early arrivals show negative numbers. DL  Delta Air Lines Inc.
UA  United Air Lines Inc.
For more visual exploration of this dataset, check out this estimator of which flight will get you there the fastest on FiveThirtyEight. The .sample() method lets you get a random set of rows of a DataFrame. Set the parameter n= equal to the number of rows you want. Sampling the dataset is one way to efficiently explore what it contains, and can be especially helpful when the first few rows all look similar and you want to see diverse data. Now that you have a sense for what some random records look like, take a look at some of the records with the longest delays. This is likely a good place to start formulating hypotheses about what types of flights are typically delayed. Wow. The longest delay was 1444 minutes—a whole day! The worst delays occurred on American Airlines flights to DFW (Dallas-Fort Worth), and they don’t seem to have been delayed due to weather (you can tell because the values in the weather_delay column are 0). January can be a tough time for flying—snowstorms in New England and the Midwest delayed travel at the beginning of the month as people got back to work. But how often did delays occur from January 1st-15th? To quickly answer this question, you can derive a new column from existing data using an in-line function, or a lambda function. In the previous lesson, you created a column of boolean values (True or False) in order to filter the data in a DataFrame. Here, it makes sense to use the same technique to segment flights into two categories: delayed and not delayed. For very short functions or functions that you do not intend to use multiple times, naming the function may not be necessary. The function used above could be written more quickly as a lambda function, or a function without a name. Your biggest question might be, What is x? The .apply() method is going through every record one-by-one in the data['arr_delay'] series, where x is each record. Just as the def function does above, the lambda function checks if the value of each arr_delay record is greater than zero, then returns True or False. This might be a strange pattern to see the first few times, but when you’re writing short functions, the lambda function allows you to work more quickly than the def function. Now that you have determined whether or not each flight was delayed, you can get some information about the aggregate trends in flight delays. 51% of flights had some delay. That’s pretty high! Better bring extra movies. What is 4 divided by 3? This calculation uses whole numbers, called integers. When you use arithmetic on integers, the result is a whole number without the remainder, or everything after the decimal. This can cause some confusing results if you don’t know what to expect. Turn at least one of the integers into a float, or numbers with decimals, to get a result with decimals. In Python, if at least one number in a calculation is a float, the outcome will be a float. Besides being delayed, some flights were cancelled. Those flights had a delay of “0”, because they never left. What percentage of the flights in this dataset were cancelled? A percentage, by definition, falls between 0 and 1, which means it’s probably not an int. Across all flights, about 2.38% were cancelled. If half of the flights were delayed, were delays shorter or longer on some airlines as opposed to others? To compare delays across airlines, we need to group the records of airlines together. Boolean indexing won’t work for this—it can only separate the data into two categories: one that is true, and one that is false (or, in this case, one that is delayed and one that is not delayed). What we need here is two categories (delayed and not delayed) for each airline. The .groupby() function allows us to group records into buckets by categorical values, such as carrier, origin, and destination in this dataset. Think of groupby() as splitting the dataset data into buckets by carrier (‘unique_carrier’), and then splitting the records inside each carrier bucket into delayed or not delayed (‘delayed’). The result is assigned to the group_by_carrier variable. .groupby() is a tough but powerful concept to master, and a common one in analytics especially. For example, a marketing analyst looking at inbound website visits might want to group data by channel, separating out direct email, search, promotional content, advertising, referrals, organic visits, and other ways people found the site. The analyst might also want to examine retention rates among certain groups of people (known as cohorts) or how people who first visited the site around the same time behaved. Learn more about retention analysis among cohorts in this blog post. See Wes McKinney’s blog post on groupby for more examples and explanation. Retain data after aggregating: By using .groupby(), we retain the original data after we’ve grouped everything. You can still access the original dataset using the data variable, but you can also access the grouped dataset using the new group_by_carrier. When using SQL, you cannot directly access both the grouped/aggregated dataset and the original dataset (technically you can, but it would not be straightforward). For more on how the components of this query, see the SQL lessons on CASE statements and GROUP BY. Though Southwest (WN) had more delays than any other airline, all the airlines had proportionally similar rates of delayed flights. You can see this by plotting the delayed and non-delayed flights. 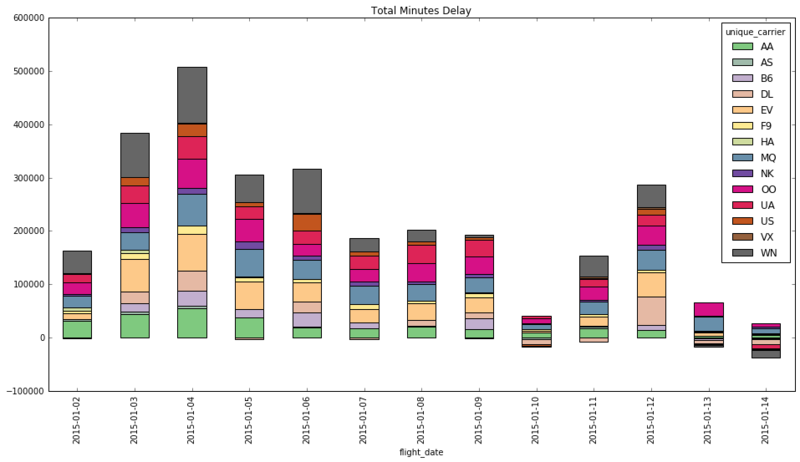 If you need a refresher on making bar charts with Pandas, check out this earlier lesson. Here’s the full list of plot parameters for DataFrames. How many flights were delayed longer than 20 minutes? Bonus Question: What proportion of delayed flights does this represent? We converted one of the flight counts to a float, because we wanted the result to be the percentage of flights that were delayed longer than 20 minutes. Because it is a percentage, that number will always be between 0 and 1, so we needed to convert at least one number to the float type. A pivot table is composed of counts, sums, or other aggregations derived from a table of data. You may have used this feature in spreadsheets, where you would choose the rows and columns to aggregate on, and the values for those rows and columns. It allows us to summarize data as grouped by different values, including values in categorical columns. In this table, you can see the count of flights (flight_num) flown by each unique_carrier on each flight_date. This is extremely powerful, because you don’t have to write a separate function for each carrier—this one function handles counts for all of them. In the table above, we get the average of values by day, across all numberic columns. That was quick! Several columns in the dataset indicate the reasons for the flight delay. You now know that about half of flights had delays—what were the most common reasons? Was there a lot of snow in January? Did the planes freeze up? The results in this table are the sum of minutes delayed, by type of delay, by day. How do each of the flight delays contribute to overall delay each day? It looks like late aircraft caused a large number of the delays on the 4th and the 12th of January. One hypothesis is that snow kept planes grounded and unable to continue their routes. In the next lesson, we’ll dig into which airports contributed most heavily to delays. Which airlines contributed most to the sum total minutes of delay? Pivot the daily sum of delay minutes by airline. Bonus Points: Plot the delays as a stacked bar chart. Southwest managed to make up time on January 14th, despite seeing delays for the first week of the month. Though this visualization doesn’t call out too many outliers, in the next lesson, we’ll see deeper measures of the distribution of the delays. In the next lesson, you’ll learn about data distributions, binning, and box plots.